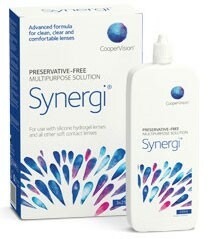 Synergi Contact Lens Solution is a preservative-free multipurpose solution so there is no uptake of preservatives onto the lens surface, specifically relevant for silicone hydrogel contact lenses. The added lubrication component within Synergi enables Improved initial and end of day comfort. The anti-microbial lens case offers extra protection.